New DK Weight Kits at Spirit Trail Fiberworks! 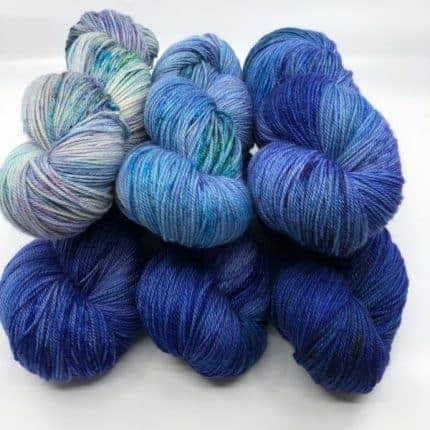 Two new kits are up at Spirit Trail Fiberworks! Both are dyed on STF Birte, my gorgeous DK weight Superwash Merino, Cashmere, and silk, six skeins and 1,650 yards in each kit. Plenty for a Comfort Fade Cardigan, or “fade” any relatively simple sweater pattern yourself by swapping out colors as you knit! These are the result of a “dye booboo” I did a few weeks ago when I didn’t put the right amount of dye in the base color bath for my “Spectral” colorway. The result was beautiful, but not Spectral. 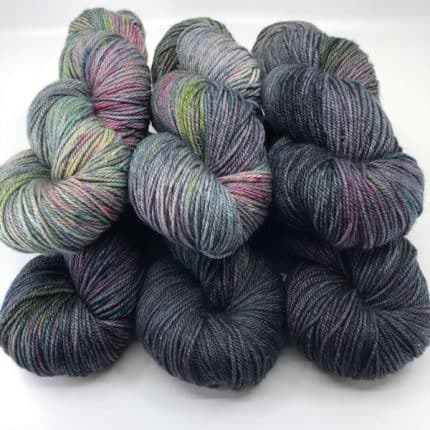 It gave me the idea to create gradient speckled kits (I’m calling them Grade-Speckles 😀 ) in some of my existing colorways. These two are Crystal Cave (the gray one) and Sea Shadows (the periwinkle one). I just listed them, and there’s only one of the Sea Shadows left at this point. But four Crystal Cave are still available (which is my personal favorite). Click the link to see more photos!